Ahead of you, the pit lane of a racing circuit hums with human activity. Race engineers, VIPs, fans, and media crews form a throng so thick you can barely make out the cars. In your pocket are a pair of Silverballers, a piano wire, and some emetic rat poison, and on your HUD is a target. You know what to do. Agent 47 has carried a few constants with him across two decades and their ebb and flow of game design tastes and vogues. There are the piano wire and Silverballer pistols which have accompanied his every outing, for example, and his ongoing search for answers about his past. Globe-Spanning sequences of missions, too, are a mainstay, likewise subterfuge within his agency or handlers. Above all, the eponymous Hitman has carried with him a series of design principles unlike any other series which remains as inimitable in 2018 as it did when the series began. After 47’s excellent episodic adventures in 2016, no grand overhaul was needed. The game ticked along at its own cadence, daunting in its scale, dark in humour, and singular in its capacity to have you salivating at a target leaning out of a third floor window, or indeed their meal left unattended in a kitchen for a few moments. The fundamentals didn't need to change, nor have they in Hitman 2. What has changed is the scale. 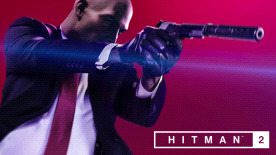 In a series that's always taken the breath away with its crowds, open areas and detailed interiors, Hitman 2 stands out. The extra space and detail is meaningful, too: every corridor is a potential path to your target, every NPC occupying that corridor is your next potential disguise, and any one of the emerging stories you eavesdrop on as you walk around the Miami race track might tip you off about the elaborate set-piece that's eliminate your prey without you needing to leave a single print on your Silverballers. Unfolding a new story with fresh insights into 47’s history and a Shadow Client to uncover, Hitman 2 builds on the most solid of foundations and delivers a stealth sandbox of unrivalled detail.